This is our 2nd son. 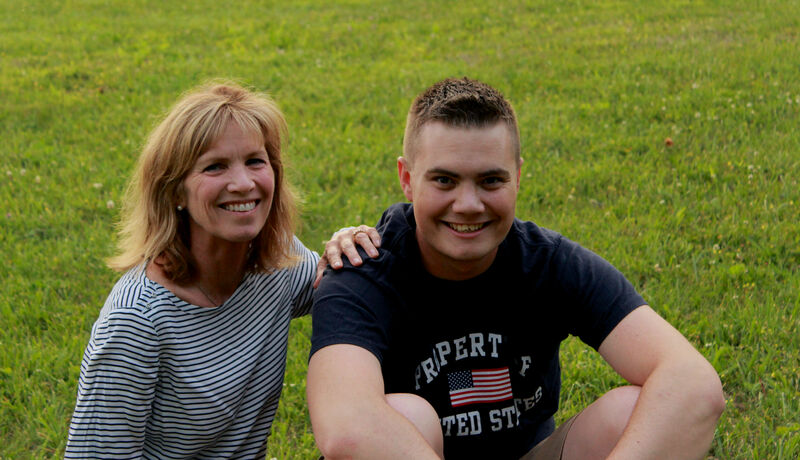 He’s in the Air Force overseas, and this picture was taken last May before he shipped out to his first duty station. He’ll be deploying to “the sandbox” a month from today. For OPSEC purposes, that’s all that can be said, but suffice it to say, this is one of those “trust in the Lord with all your heart …” experiences for me. It’s been a year since we’ve seen him, at least, in person. We Skype fairly frequently, but virtual hugs via an online video chat don’t pack the same punch. Physical touch is so important, isn’t it? If you think about it later today, give someone you love a hug, because it matters. They matter. Make sure you show them! Because of said deployment, it will be the better part of another year until I can hug this guy with my own two arms. I guess because the anniversary of D-Day took place last week, and there was a surfeit of military movies and documentaries on television, such as Saving Private Ryan, I wondered how old our military is today. During World War II, when Saving Private Ryan took place, the majority of our fighting forces were under the age of 25. Today, that hasn’t changed all that greatly; 43% of active military is under the age of 25. My husband & I watched a documentary about D-Day the other evening, and some of the “men” who served in WWII lied about their age; many were only 17 when they invaded Normandy. Our son isn’t 17, but to me, anything under 25 still seems awfully young. I can’t imagine how mothers sent their sons off when they barely had whiskers on their faces to shave. Or how family members made do with communication prior to the 1990’s, when the digital world made “instant” access much more available. I think about my grandfather, who fought in France and Austria during World War II, close to the same age as my son, To receive mail on either end took about a month. My grandmother had kept bundles of letters (from my grandmother to him, and him to her) and a letter sent on October 18th, might only be referenced in a November 15th letter. That’s a long time (at least by my standards) to be out of touch, I feel so blessed to have virtually immediate contact with my son via Skype, Skype instant message, Facebook Messenger, Magic Jack phone, etc… Even snail mail or a package arrives in about a week’s time. And I know, because I can track its every movement online. Notwithstanding, a real hug, especially before he leaves for that dusty, sandy, arid part of the world, would be better than any other gift I could ask for. Enter your email address to subscribe and you'll receive notifications of new posts!